Recently, I was given the opportunity to check out Universal Orlando’s latest nighttime show. I’ve never seen an evening show at the park before, so I was looking forward to the experience. My past experience with nighttime shows at Disney, however, had me anticipating a crowd and long wait for a good seat. To my surprise, that wasn’t the case at all. Unlike the shows at other Orlando theme parks, there are multiple locations along the water front that you can view the show and still have a front row experience. 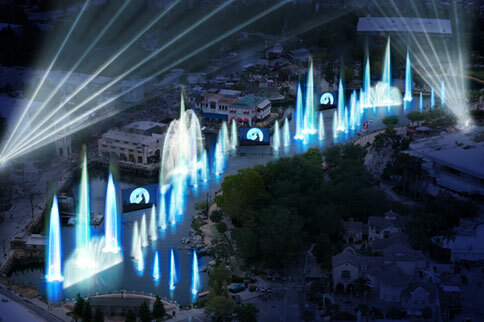 The Universal Cinematic Spectacular: 100 Years of Movie Memories is a nighttime lagoon show that features some of Universal’s most iconic film moments. The show is projected onto state-of-the-art water curtain technology and is surrounded by colorful fountains and amazing pyrotechnics. As Mother Nature’s lights started to dim, the water screen started to come alive. Lights… Camera… Action! The show began. The first thing I couldn’t help but notice was the narration given by Academy Award winning actor, Morgan Freeman. I don’t think they could have made a better choice. As soon as it started, my son couldn’t take his eyes off the water screen. We were all taken back by the pyrotechnics that shot off not only from the lagoon, but also all around us from various locations in the park. In addition to viewing the show, I was given the opportunity to interview one of the individuals behind the show’s creation, Micheal Aiello. Since 2003, Mr. Aiello has had a major role in the Universal Orlando Halloween Horror Night event. He’s been responsible for writing and directing the extremely popular “Bill and Ted’s Excellent Halloween Adventure” as well as working with New Line Cinema to co-create content based on A Nightmare on Elm Street , Friday the 13th and The Texas Chainsaw Massacre as well as Universal Pictures’ The Thing . He is also responsible for overseeing the concept and development for the entertainment elements within The Wizarding World of Harry Potter. MA: Although Romance did not get a specific “100 Years of….” category, romance is heavily featured during the end of our “100 Years of Triumph” section. This is there where you see clips from Shakespeare in Love , Knotting Hill , Pillow Talk and Atonement among of few others. The Triumph section was all about those classic finale moments a hero can go through: Defeating the villain, achieving the goal, getting the girl, etc. MA: Universal Studios began 100 years ago by creating the horror film genre with films like Frankenstein , Dracula , The Wolfman and later Psycho and the films of Hitchcock. Horror is an incredibly important part of our history. We really wanted to recognize it and give it its due. MA: I really feel we hit on a brilliant cross section of the well-known films in Universal’s library. We have the biggest hits, like E.T. , Back to the Future and Fast and the Furious , but also a few cult films, like Shaun of the Dead and Scott Pilgrim . There really is something for everyone. Overall, I’m happy I stayed to check out the show that night. My favorite part as a parent, was not having to wait very long to secure a good seat. My son enjoyed the show with its mix of elements and inclusion of some of his favorite movies. When it comes to this show, there really is something for everyone. I was given park tickets to check out Universal Studios Cinematic Spectacular — 100 Years of Movie Memories . Though I received this benefit, I have given a review that is completely my own.